The new Apex 19 and Apex Pro 19 are here. 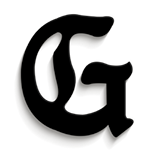 We have all of the info for you on the Home Page here. Those are beautiful!!! Can't wait to hear more from the Granddaddy folks as I assume many of them chose these. Oh my. OH MY! I now know what love at first sight is like. I've waited 5 years for this and I am not disappointed. Excited to hear about Team THPs experiences and to get these in the bag. These look incredible! Looking forward to reading the feedback about them. These are hands down the smoothest feeling irons I have ever hit! 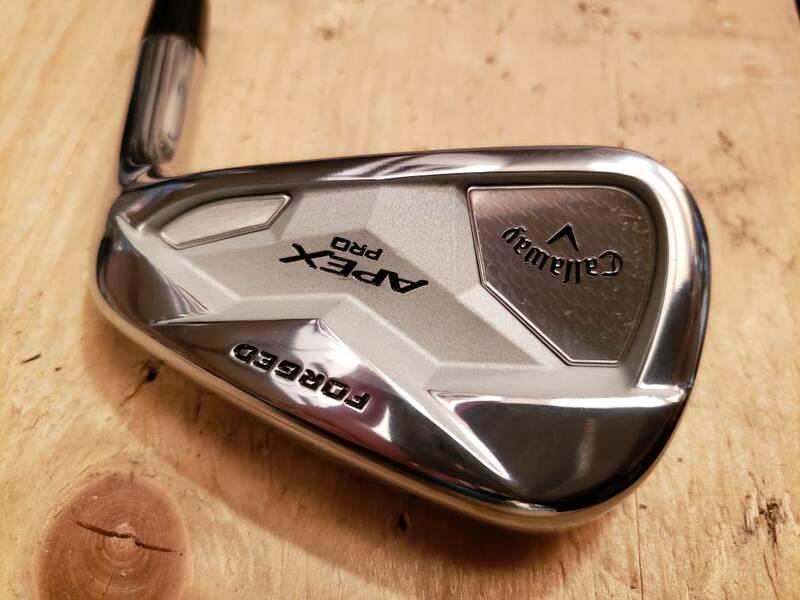 I hit these irons better than my previous set and other than the fitting, that was all the time I had with them, which I had been gaming just over a year if that tells you anything. I gained a half a club on distance. Also, I had never tried the CF-16s. My previous irons were the Callaway Steelhead XRs, which were good irons, but these outperform them all day every day. One thing I would like to point out is that these are true forged irons as well. Not just the face. The sound of them is so crisp! I love it! I went to #TheGrandaddy most excited about the driver fitting, but after seeing these on the first day, I couldn’t tell you what I was more excited about, these or the driver. The more I hit these irons, I continue to fall in love with them even more! I am still seeing at least a half of a club difference. For example, I normally hit my 8 iron around 150 to 155 in summer temps and now I am seeing 155 to 160 consistently in 40 to 50 degree weather. I will be interested to see the distances when things warm up! All in all, these are my favorite irons I have ever gamed, and they haven’t been in my bag that long! More to come! Oh my goodness... Those are GORGEOUS. 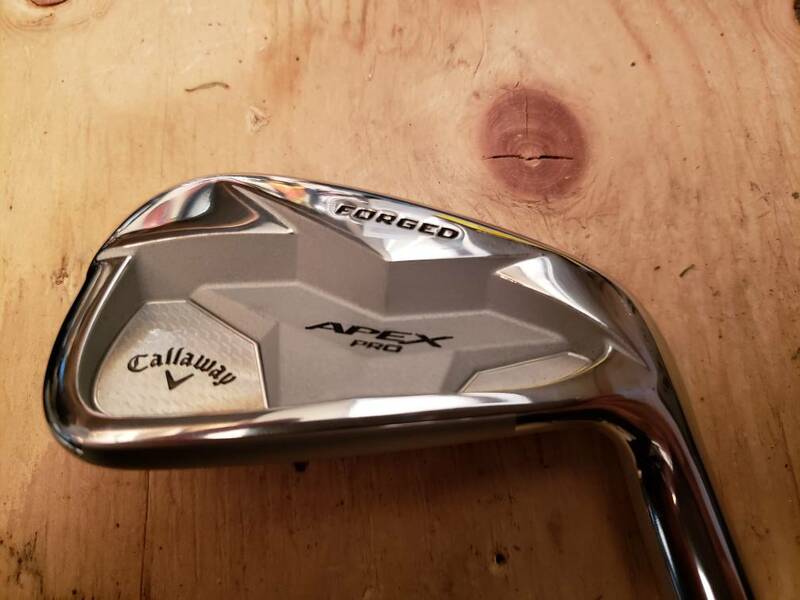 I started playing the Apex series of irons from Callaway Golf four years ago. First, I played the standard Apex for two years, followed by the Apex CF16’s for the last two years leading up to the #TheGrandaddy. I’ve been a big fan of the series with 3 Holes-In-One using them and multiple rounds where I have shot my age. I figured going into the fitting that if I could just maintain that same level of performance I would be more than pleased. That level was met and then some. I am big on a simple, plain and clean look in a set of irons, no colorful, gaudy badging (is that a word?) on the back. I also prefer a “players” cavity back over SGI-type irons. “Pro” versions of irons don’t give me the forgiveness that I sometimes need when my game is “off”. The Apex series has always met that criteria and this set of ‘19s is no exception. The finish is a nice satin finish. The top line appears to be slightly smaller than the CF16s and the offset slightly less, but I don’t have the specs as I write this to confirm either of those things. Sole width appears to also be thinner and slightly less rounded at the back. Heel to toe length, again, very similar as well as height of the clubface. Overall I would say the Apex 19’s are a tad more compact. During warm up for the fitting I also hit the Pro version but preferred the feel and performance of the standard Apex ‘19. So that is what we concentrated on during the fitting. 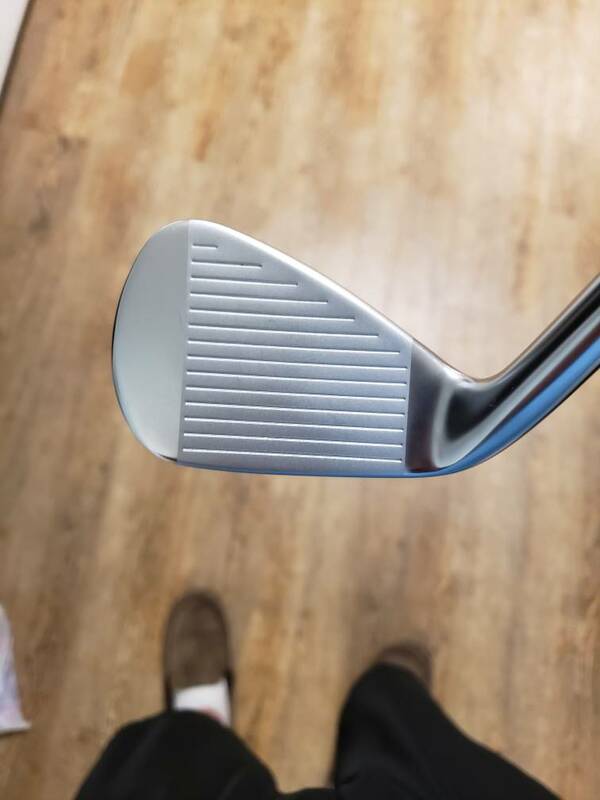 I mentioned in my fitting recap that I was not getting the numbers that I would have expected during the fitting compared to what I experience at home with the CF16s. The overall distance with a 7i was at least ½ club longer but when hitting irons I look to carry distance when deciding which club to hit and that was a little shorter than I was expecting or hoping to see. I was told the distance will be there but the “loss” was due to being in the 1st group to be fit as it was very chilly and we were pretty much at sea level. Based on spin, ball speed and launch angles I was fit into the UST Mamiya Recoil 760 F2 shafts (F2 is basically a “senior flex”). Based on little stronger lofts in these, 48° AW, gapping at the bottom end was a serious discussion so I went with the 6-AW with three wedges which will be reviewed separately, as will the driver and fairway woods and the hybrid. The clubs looked spectacular sitting in the bag when I got to my cart on day 1 of the competition. I made my club selections during the two days of golf based on my normal yardages and I was not disappointed. The feel all day was incredibly solid and extremely consistent throughout the set. I truthfully do not know if that is a characteristic of the set or because they were built by the pro department at ECPC. Turf interaction at The Hideaway was never an issue and distance control was spot on. Even strikes slightly off center saw minute losses of distance if any. I did not experience any fliers or unexpected results hitting them at any time. The lofts on these are a couple of degrees stronger than on the corresponding Apex CF16 club. However, due to the weighting this is necessary to keep the ball flight down. Otherwise one would lose distance if the lofts were kept more “traditional”. Since returning home and using them I continue to be struck by just how solid they feel and sound, consistent from one club to the next. It truly is a “powerful” feeling in that the ball just seems to explode off the face, and they also feel “softer” than the Apex CF16s. 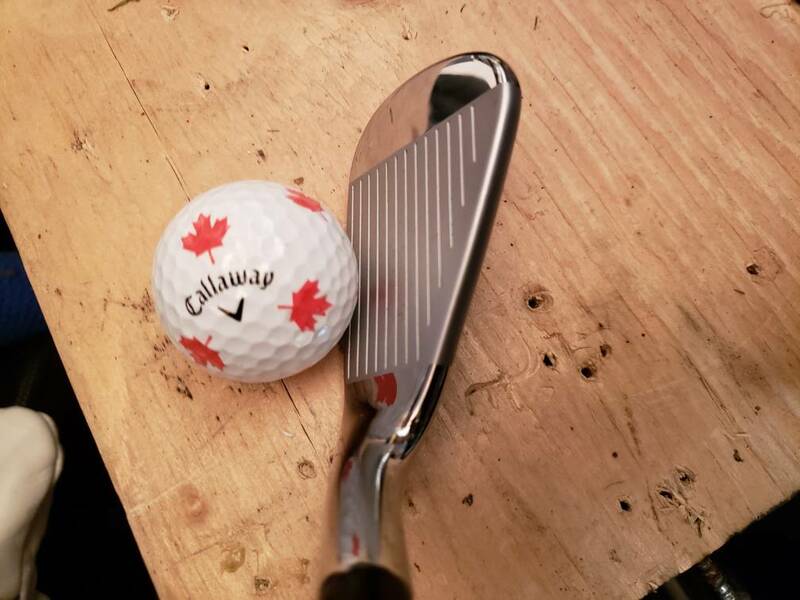 In 50° type weather I am seeing full summer like yardages to maybe ½ club longer and the ball just wants to go straight (I’ve been using the regular Chrome Soft). Is that distance increase a function of the technology built into the clubhead or perhaps a more suited shaft? It is probably a combination if I had to guess. Distance control is spectacular and I feel like I am shooting darts when I put one of these irons in my hand. 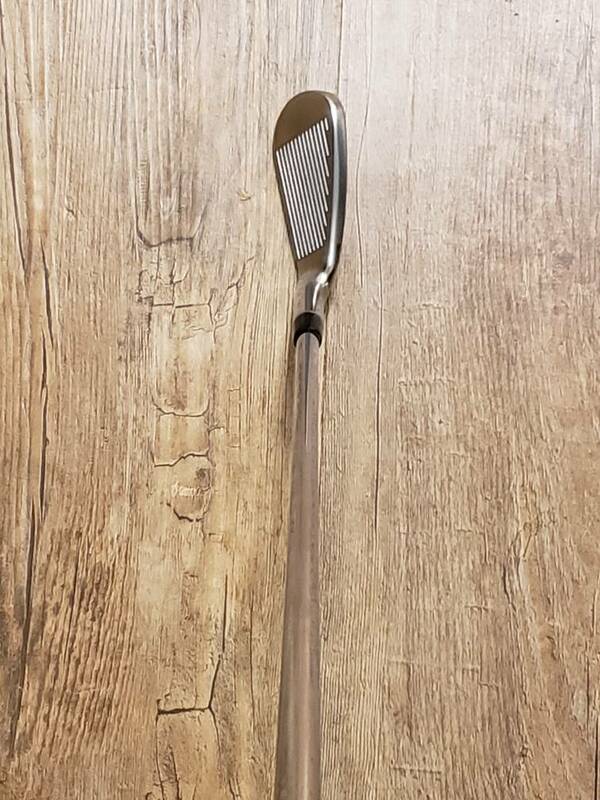 The technology behind these is the same / similar to what had been explained in the Big Bertha irons with a “floating” tungsten weight, positioning of which is unique to each club. These looks A1. Excited to hear the thoughts of the GD guys. I'm still super happy with my 16's, but I'm sure anyone looking for an upgrade need to hit these. The long awaited refresh to the Apex line is finally here, and this time it's more than a facelift. In the past the Apex Pros were compact forged irons with progessive CGs, and vibration dampening material used throughout the set. This time around Callaway wanted to jam every bit of tech possible into the heads, but without sacrificing their size and profile. 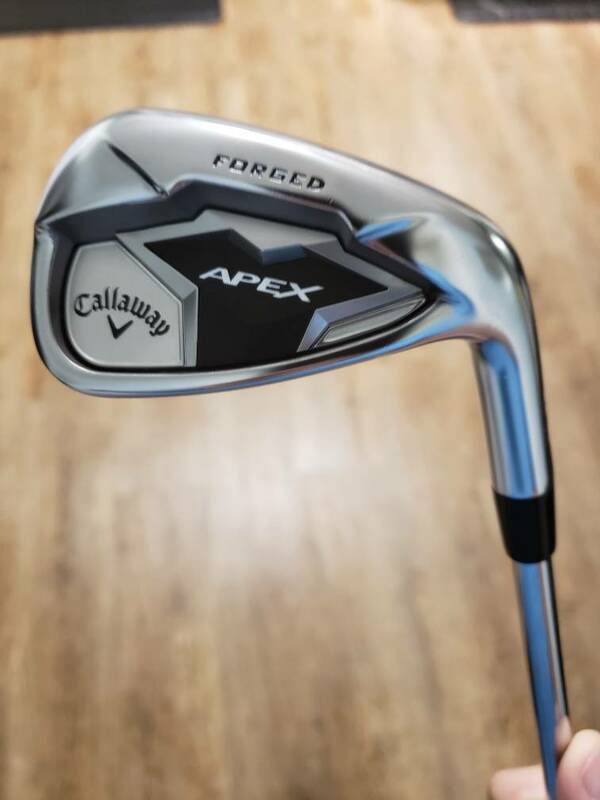 The result is a set of irons with beautiful looks, dimensions that firmly place it in the "players iron" category, and Callaway's legendary Cup Face tech from the long irons down to the 7 iron. The irons feature a combination chrome and brushed finish. The main body is chrome while the face and cavity are brushed, and there are two small shiny accent badges in the upper corners of the cavity. Top line is nice and small without being a butter knife, and the sole width is certainly on the narrower side as well. Blade length is pretty standard (not long, not short). Offset is present but it's really quite minimal and not worth spending any time on. All these things combine to present an incredibly attractive package. The 8 iron down to the A Wedge have a nice solid forged feeling. Soft, solid, and pleasing. 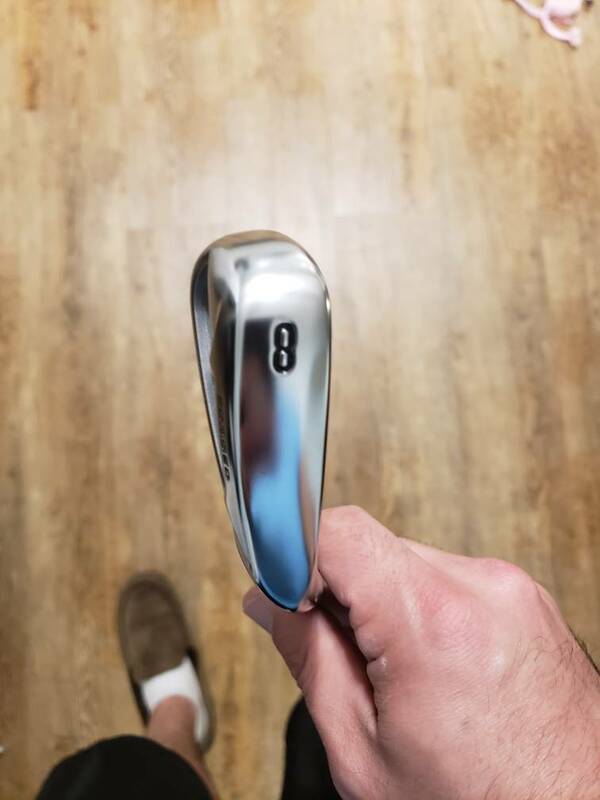 The feel in the 5i to the 7i is slightly livelier and higher pitched but is very surprisingly still appropriate and it matches the ball flight - if that makes any sense. When it comes to performance these irons deliver in spades. In the long irons I have never hit an iron that looks so small & hits so big, and I've already hit some shots with the 7 iron that make me think I'm way better than I am. The short irons are precise and consistent, with a flight that's higher than expected and steep descent angles. As a set overall, they are lower spinning than some other sets in the same category, but they make up for it with added speed and height. 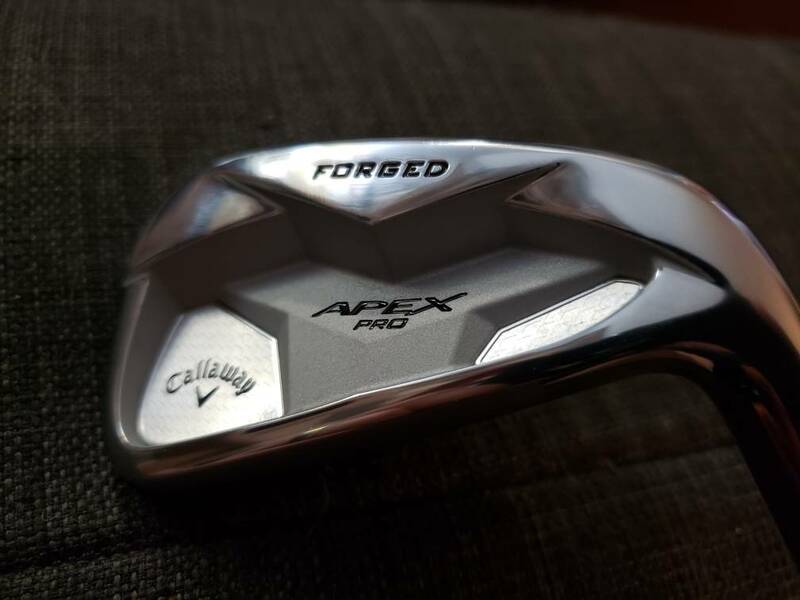 As a quick 7-Iron comparison to the Callaway X-Forged, I've found the the Apex Pros launch the same and spin approx. 500 rpms less, but with 5-6mph more ball speed the Pros peak higher and descend at the same angle. Basically they have more firepower and sacrifice nothing.